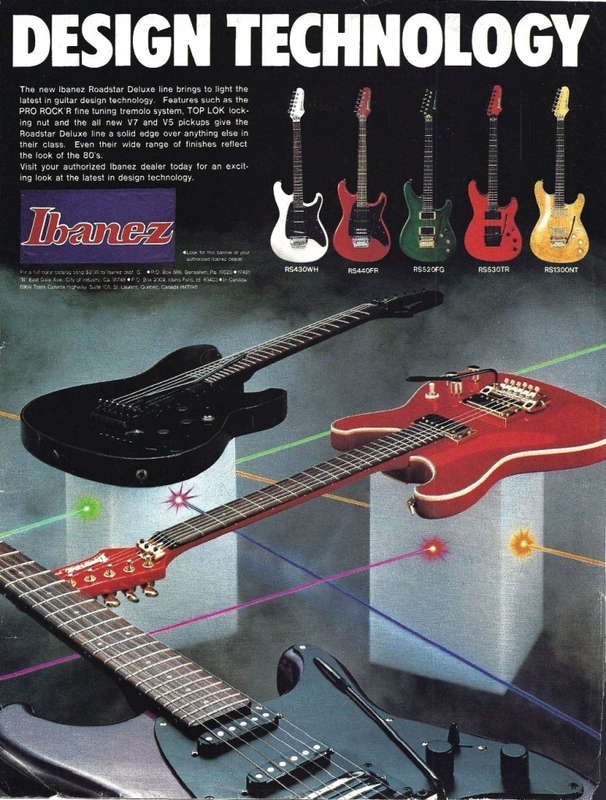 This Ibanez advert features the a selection of models from the Roadstar II Deluxe Series. This series was the foundation of what eventually became the hugely successful RG series. "DESIGN TECHNOLOGY. The new Ibanez Roadstar Deluxe line brings to light the latest in guitar design technology. Features such as the PRO ROCK’R fine tuning tremolo system, TOP LOK locking nut and the all new V7 and V5 pickups give the Roadstar Deluxe line a solid edge over anything else in their class. Even their wide range of finishes reflect the look of the 80's. Visit your authorized Ibanez dealer today for an exciting look at the latest in design technology."